Fix lag, speed up Internet for Windows PC & lower your ping! 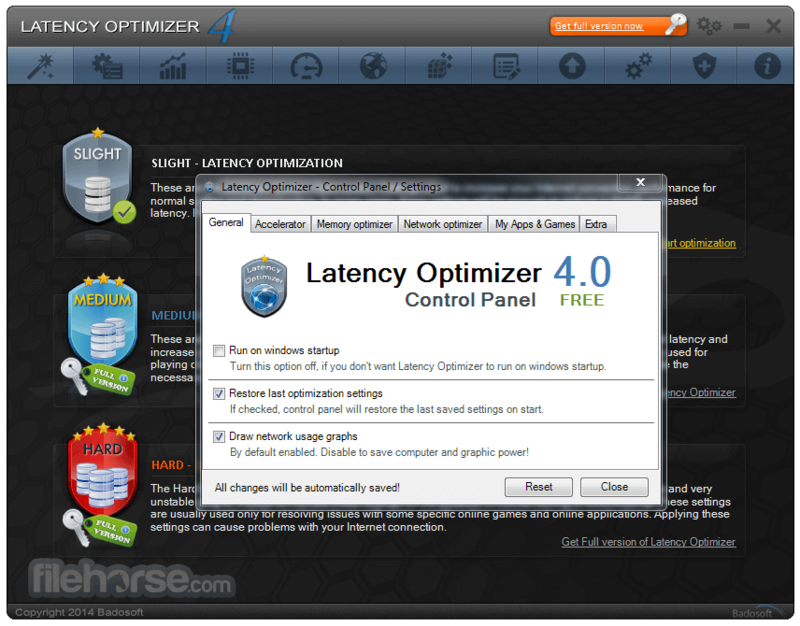 Latency Optimizer assists you to fix lag, reduce lag, and speed up Internet & PC. Boost your online games, Web browsers and VoIP services! It comes with a set of powerful optimization, testing, analyzing and cleaning tools to assist you to reduce high latency, fix lag, improve FPS, boost games & applications and speed up Internet connection & PC! It also includes a Performance Recorder, Speed Test, Ping Test, Packet Monitor and Latency Test. Those Tools will help to analyze the causes of lag, low ping, high latency and FPS drops in online games and application. You can record your Computers Performance while playing or working, measure your ping, up and download speed, monitor your network and test the status of your current latency. Beside this, Performance & Network Optimization Tools, System Memory Optimizer, Startup Entries Manager and a System Cleaner to boost the performance of your Internet connection, Web browser and PC either for surfing, online gaming, online services like VOIP, real time applications like auctions and more. The three easy to use latency optimization modes are not only used to reduce high latnecy and fix lag, applying these modes will also speed up Internet connections by misconfiguration and give you a better surfing experience. 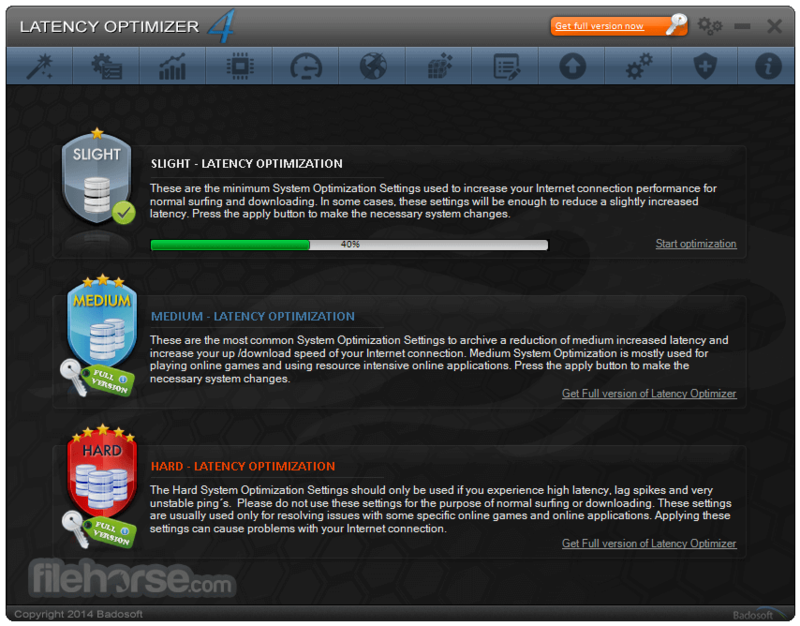 These modes are essential for letting Latency Optimizer act as a Online Game Booster for your online games as well. The Advanced settings of the program are the heart of this powerful application! Here you can apply individual settings to reduce high latency caused by your Internet connection settings or misconfiguration of your system. You will be able to save/load your individual configuration settings at any time to be flexible either you are playing online games or use online applications or services. In combination with the new Game & Application Manager it gives you the possibility to decide if you want to focus on a specific online game, MMORPGS, 3rd person Shooters, Adventures, Sport games and many more. The new implemented Control Panel in Latency Optimizer provides you with quick and easy to use functions via your quick access bar. You can enable a special designed game accelerator, network or process optimizations. The Performance Recorder included in the new Control Panel will record your computers performance while playing online games or while working with online applications. The Performance Recorder will create a detailed log file that will help you by your investigations to find causes of lag, low ping and FPS drops. You will be able to share the log file with the support team of your online game, computer specialists, friends or tech forums. Measure your upload, download speed and ping & 'Save your Speed Test', analyse the results, compare your previous tests. Run the Latency Test that will simulate your connection and computers processing performance to a game or online service server. Clean up your system from temporary files, history, cookies, temporary files, log files, clipboard, DNS cache, memory dumps, third-party applications,... clean your disk, tweak up your pc performance. Boost your PC performance with 1 click predefined optimization modes and 45 Tweaks & tunes among extra features that can boost your PC performance, RAM, CPU, Network. The Performance Tweaks will let you make certain settings to increase your computer performance speed. Note: Multiple features are disabled in free version.